It is named al-Fatihah, the Opening – because it opens the Book and by it the recitation in prayer commences. It is also named Ummul Qur’an, the Mother of the Qur’an, and Ummul Kitaab, the Mother of the Book, according to the opinion of the majority. This was mentioned by Anas, however al-Hasan and ibn Seereen disliked this appellation reasoning that this was the most fitting description for the Preserved Tablet. 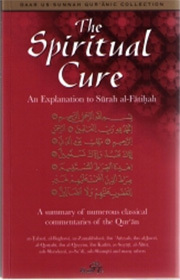 Ibn Jareer at -Tabaree said that it was named so because the meaning of the entire Qur’an is summarized therein. The Arabs named anything that concisely summarizes something or comprises the most important part of something Umm, or Mother. For similar reasons it is also named al-Qur’an al-Adheem, the Great Qur’an.